I’ve been really busy in the studio lately working on projects for my company Double Dare. We are gearing up for our spring 2015 collection, and I’ve been busy sketching ideas, and taking those ideas into illustrator to create vector drawings to be screen printed! I spent a lot of time sketching out ideas, and working on colour schemes for a set of four prints that we will launch in about a month’s time. 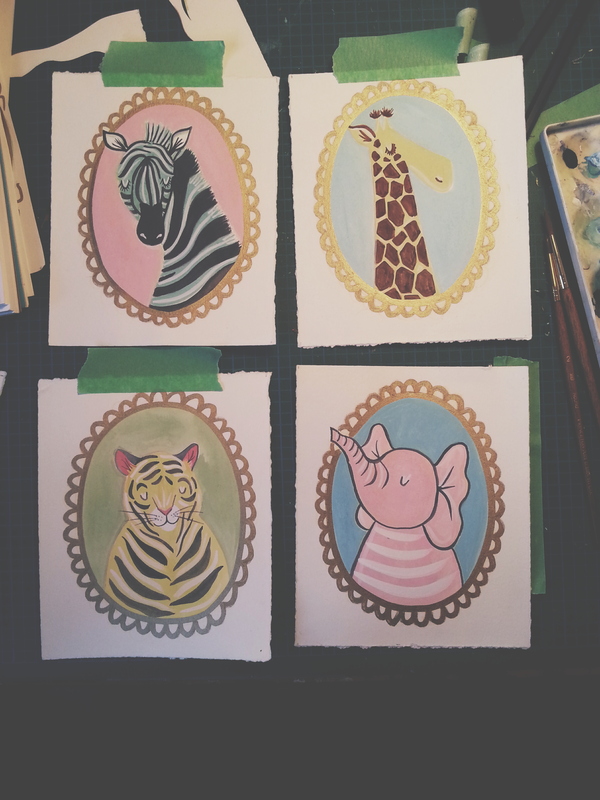 During the sketching phase, I was basically just testing, trying to find the right shapes and forms to make up the animal portraits, playing with colour, and experimenting with different ways to draw the illustrated frame. We really wanted to head into the new year allowing ourselves as much time as possible for planning and experimenting, because really, that’s how the best work gets created! When I had finally come up with four sketches that I was excited and happy with, I moved into the next stage which is getting those ideas ready for print. 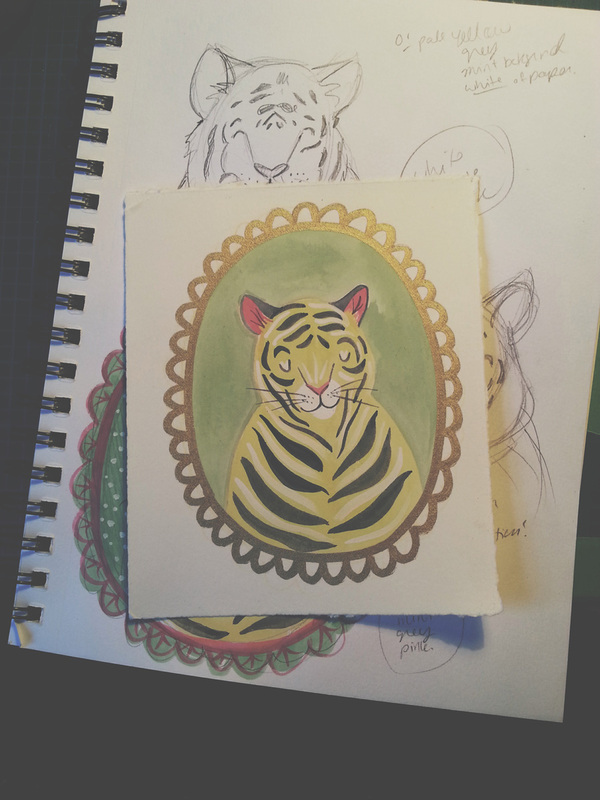 I used velum paper this time and traced over my original sketches so that I could keep them as close as possible. I then scanned in the traced images and began to vectorize my work. 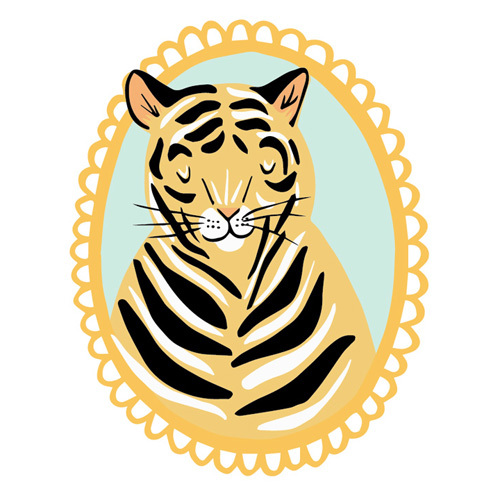 Here’s the final result for the vectorized tiger in colour! I’ve been learning illustrator as I go along, and I’m definitely seeing some improvements! I’m still a long way away from being a pro (I’m still pretty slow and rely on google ALOT for answers…thank god for google), but as time passes and I continue to learn about the program I see my work in illustrator moving forward. Basically in the end this is what the file looks like. It is officially ready to be burned to our screen once this document is printed onto acetate. Each image is a separate colour that will be layered to create the final print similar to the colour image above this one! Your blog ist just too dope! So funny, creative and colourful 🙂 Great job! !